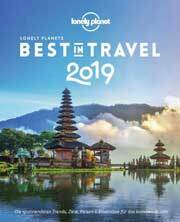 Today, Lonely Planet unveils its annual collection of the best travel destinations, trends, journeys and experiences to have in the year ahead. The experts at the world’s leading travel authority reveal the top 10 countries, cities, regions and best value places to visit in LonelyPlanet's Best in Travel 2019. Sri Lanka – the island opening up to new travellers like never before – claims the coveted spot as the number one country to visit in 2019, while Germany places second and Zimbabwe takes third. Denmark's "capital of cool", Copenhagen, is named the number one city as it boasts a world-renowned food scene and credentials as a design powerhouse, followed by the "Silicon Valley" of China, Shenzhen, and Serbia’s up-and-coming youth and culture capital, Novi Sad. The number one region is the Piedmont area of Italy, home to Leonardo Da Vinci and new UNESCO heritage sites. Celebrating 50 years since Woodstock, the USA’s Catskills in New York came in second, followed by Northern Peru. Egypt’s Southern Nile Valley, Lodz, Poland and the USA’s Great Smoky Mountains are named the top three best value destinations for 2019. Each year, Lonely Planet’s Best in Travel lists start with nominations from Lonely Planet’s vast community of editors, researchers, locals and influencers, and ultimately are decided and ranked by a panel of judges. The outcome is an eclectic list of destinations with unique, compelling and topical reasons to visit in the year ahead – as well as underlying travel trends to look for. Lonely Planet’s experts also select the best New Openings, Places to Stay, Food Experiences and Attractions for Kids. "These are the places to experience in 2019", says Lonely Planet spokesperson Chris Zeiher. "They might be coming into their own, celebrating a once-in-a-lifetime event or simply have been overlooked for too long – whatever the reason, now is the time to plan a trip." The best-selling book is now in its 14th edition and the landing page, www.lonelyplanet.com/best-in-travel, features tips and videos on visiting each destination as well as a chance to win a trip for two to Copenhagen. Most of the top 10 cities can also be explored with Lonely Planet’s Guides app.